ShoutBrands offers white label digital marketing products to independent entrepreneurs and marketing agencies. 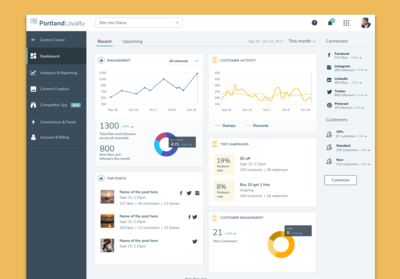 Their existing suite includes tools for social media management, digital loyalty, reputation management and proximity marketing. While social media marketing is now more established, additional digital marketing channels that utilize technology to compete for customer engagement and are fast gaining momentum. These days, it’s hard to get beyond the cash register without being asked the inevitable question “Are you in our loyalty program?” ShoutBrands has capitalized on these trends with their innovative platform, attracting users from all over the world. We partnered with ShoutBrands to re-envision their offering and to seamlessly consolidate their user experience. They were looking to reduce abandonment and increase adoption of multiple products within the suite. In addition, they wanted to improve the overall quality and usability of the experience. We came armed with our design thinking tools and techniques to help them establish a future product vision that would address their needs. We started (as we always do) with the user, conducting initial interviews to understand their motivations and pain points. We observed them using the existing ShoutBrands products and listened as they described their experiences and goals. Through these interviews, we realized that within the target audience there were two distinct archetypes: the “eager entrepreneur”, and the “cautious explorer”. These two archetypes, or personas, had very different needs and challenges to be solved by the same platform. This understanding directly influenced many decisions made in the design process. While one archetype was looking for actionable analytics and specific features to distinguish their brand, the other was looking for more hand-holding and support as they establish themselves in this new marketing endeavor. In parallel to this qualitative research, we analyzed competitive and comparative experiences to clarify the digital marketing ecosystem and identify ShoutBrands’ opportunity within it. One of our key findings was that competitors are not offering a single comprehensive platform for digital marketing entrepreneurs. Although some were large and established players, their offerings were primarily focused on one channel of digital marketing (for example, social media). This analysis validated the opportunity for a platform that combines all four areas of digital marketing into one inclusive solution. With their existing tools, start-up mindset and broad industry knowledge, ShoutBrands is uniquely positioned to pioneer this space. The ShoutBrands team joined us for a day-long ideation workshop where we used the insights we uncovered to generate ambitious ideas. We mapped the current customer journey and ideated for the future. Moving from hand drawn sketches to rapid prototypes, we redefined the entire customer experience, seamlessly combining the previously siloed products into one comprehensive platform. 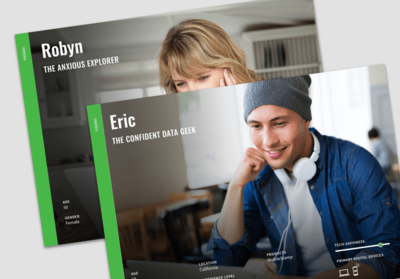 We created features and functionality with our two customer archetypes in mind: advanced analytics tools to help our “eager entrepreneur” track and focus efforts for maximum impact, and simple, highly usable interfaces that provide assistance along the way for users who needed extra hand-holding. We tested our clickable prototype with existing users, and received excellent validation of the design. 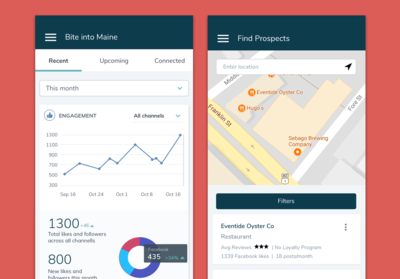 Our human-centered design approach provided ShoutBrands with a deeper, more empathic understanding of their user base and areas of future opportunity. The hi-fidelity prototype gave them a very tangible realization of an ambitious future vision in a relatively short time frame. We can’t wait to see what comes next for this entrepreneurial team and their products. 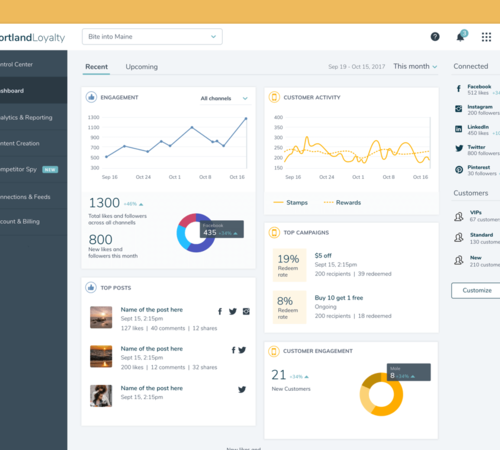 Freeport Metrics helped us to reimagine the entire user experience and design of our SaaS platform. They not only showed us what was possible but also how, from a technological standpoint, it could be achieved. Their creative thinking and fresh approach to road-mapping continue to inspire us as we push forward.